Scroll down to the section “Is my Facebook account impacted by this security issue? Here you’ll see a Yes or No answer to whether your account was one of the 15 (the number is moving up and down it seems !) million users impacted. Those affected will also receive a warning like this image here. A. You’re in the 10 (estimated) million users’ whose name plus email and/or phone number was accessed. B. You’re in the 14 (estimated) million users’ who had that data plus account bio data accessed including “username, gender, locale/language, relationship status, religion, hometown, self-reported current city, birthdate, device types used to access Facebook, education, work, the last 10 places they checked into or were tagged in, website, people or Pages they follow, and the 15 most recent searches, plus if you like chocolate chip cookies or not! Are you wondering what you should do if you are A or B? clicking Settings and clicking Security and Login. Scroll down to See recent emails from Facebook and click View. 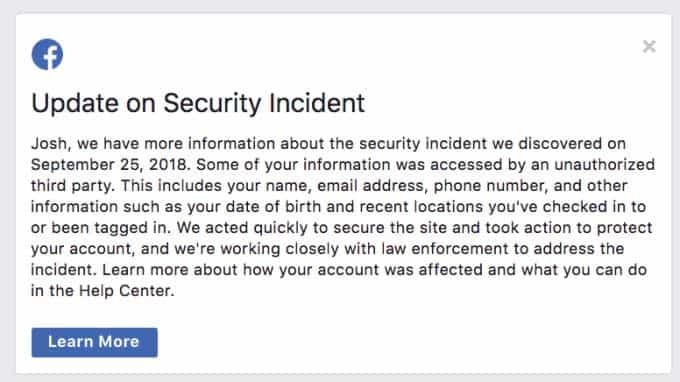 Facebook didn’t state that data was removed during the security breach, so there is no reason to run out and change credit cards etc. However in our previous posts we talked about Group A, B, and C.. Group B may want to contact their bank and have their pin changed as there may be enough information there for hackers to be able to ‘guess’ codes, or provide security answers to banks. Really it’s about taking responsibility for your own data, and not assuming that Facebook will do it for you.